Minister of Jerusalem Affairs 'expects Defense and Justice ministers to push their ministries to do everything they can to protect Amona'. Jerusalem Affairs Minister Ze’ev Elkin spoke with Arutz Sheva on Tuesday regarding the planned evacuation of Amona, calling upon the Justice and Defense ministries to do everything in their power to find a solution for the embattled community. Amona, a small town located near Ofra in Samaria, is slated for destruction, after the Supreme Court ruled the community was built illegally on privately owned Arab land and must be demolished. In 2006, security forces violently removed hundreds of demonstrators during the demolition of nine houses in Amona, leaving hundreds injured. Given the town’s history, said Elkin, residents are justified in their concerns. In the case of both Migron and Givat HaUlpana, efforts to prevent the evacuations failed. 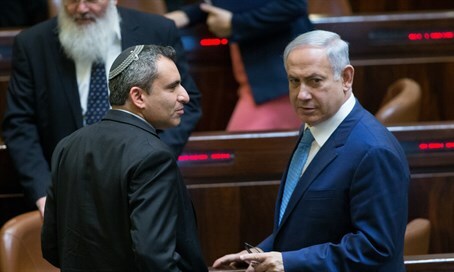 Despite his concerns, Elkin was hopeful that Justice Minister Ayelet Shaked (Jewish Home) would cobble together a majority for reforms which would enable the government to legalize Amona. Elkin also noted that “there exist other judicial solutions which do not require legislative changes”. While the judicial establishment, he acknowledged, opposed such moves, Elkin called upon the Justice and Defense ministers to compel their respective ministries to take action.